The Peregrine Chick is the online alter-ego for the Project Coordinator of Manitoba's Peregrine Falcon Recovery Project. 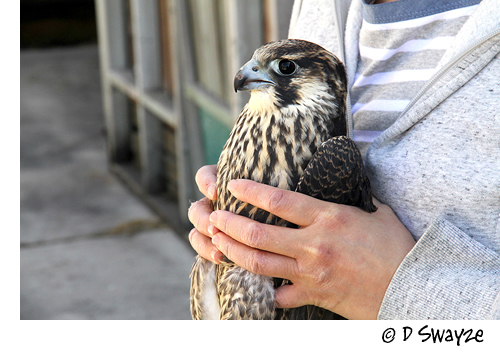 The Project has been working to re-establish a self-sustaining wild peregrine falcon population in the province. 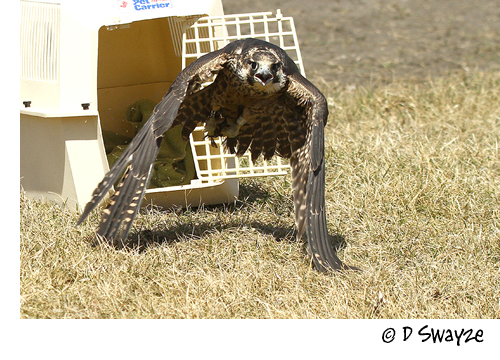 2010 is the thirtieth anniversary of our efforts and to-date over 200 peregrine falcons chicks have been released through our efforts and many of them have gone on to raise young of their own across the Canadian Prairies and the US Midwest. Last October, the folks at the Wildlife Haven Rehabilitation Centre received an injured peregrine falcon from the Brandon area. It was a young bird, hatched in 2017 but because she had no legbands, we don’t know where she had hatched. Was she a Manitoba bird? Possible, we were unable to band two female chicks last year because of concerns for their safety at band age. But we really couldn’t make that assumption since by October all of the peregrine chicks hatched in North America are on their own, floating about the continent doing what “teenage” peregrines do – hunt, eat, sleep, repeat. So while we can hope this young bird is a Manitoba-hatched bird, we couldn’t be sure. To the folks at Wildlife Haven, it didn’t matter where she came from. 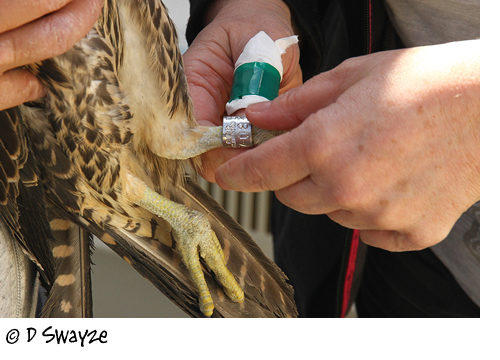 They examined her and found she had a fracture in her wing that with care, rehabilitation and some luck could make her a candidate for release. But it would take time and given that it was already October, that meant she was staying the winter. When unbanded peregrines are ready for release, the Project bands them so that if they reappear (as happens surprisingly often) we would be able to identify them and know something of their history. So when this young lady was ready for release, we got the call. In a normal year, we would have arranged to release the bird as soon as possible, but with the very late spring, we asked to delay her release until we were sure there was more than just pigeons around for her to hunt. She’d been on her own for (on average) about two months before she was injured so while she knew how to hunt, it had been six months since she’d had any serious practical experience. Fortunately we were able to push her release date back a couple of weeks and as luck would have it, the day was perfect – warm with only a light breeze, nothing that would cause her any problems. We had already scouted out a release location, one near the Red River with lots of space for her to stretch her wings and with a variety of wild prey nearby. Before heading out to Wildlife Haven’s Centre near Ile des Chenes, we detoured past the release site for a last check, just in case. As we were leaving, we spotted another peregrine (remember, good food nearby). Dennis as always had come prepared and we were able to get a couple of photos and … well, you will need to wait for that story, this post is about our young female’s release. So off we went to Wildlife Haven to meet with Tiffany from the Animal Care Team. The young peregrine was out in one of the flight cages and she was raring to go. Having said that, she was none too pleased when we entered her cage and even less pleased when we caught her. He displeasure took the form of drawing blood – girl has fast, strong feet! Didn’t stop us however and she calmed down when we started the banding process. Calm ended however when she realized that the last part of her journey to freedom involved being stuffed into a pet carrier for the trip to the release site. But like with the banding, she settled down quickly while we travelled – faster than most of the birds I’ve travelled with in fact! Finally we reached the release site and got her carrier set up so that she had the perfect trajectory for her release – lots of clear space and well away from as many hazards as we could foresee. Because she’d already been handled quite already, we decided to let her set her own pace. We put the carrier into place, opened the door and quietly backed off. She took a long look out the door of the carrier then hopped out, took a big breath and leapt into the air and headed east out over the fields with strong wingbeats. Almost looked like she already had a plan in mind. A couple of crows halfheartedly followed her out over the river then they lost interest and we lost sight of her. All that there was left to do was pack up and head out. So why did we name her Lyra? Our first tentative date for her release occurred during the peak of this year’s Lyrid meteor shower. The comet C/1861 G1 Thatcher sheds dust this time each year which becomes visible as a meteor shower in the constellation Lyra. The Lyrids are the oldest recorded meteor show – they have been observed and recorded since 687 BC – longer than any other modern meteor shower. Seemed like a good name for a bird we hope will return to nest somewhere in April for many years to come! Thank you to Dennis for the use of his photos!